I backed up the save before replacing them. I just updated to v37h which only features changes we discussed. No version info. changed only the posting date. Thanks for the screenshots, you made a pretty epic fort already.. I'll update files and try to make an even better fort by trying to take into account how sensitive dwarfs are now. Did you by chance also adjust the custom world gen options? I did not update advanced world parameters yet, when I do I will call that v38. You would get more FUN! using them, if you can manage to gen a world 130-150 years or so. If you want to hold off for the update, that's fine. I will try to make it asap. Most features of DFHack should work, but possibly not world gen. I will upload the long overdue [44.12] Start Pack this week. Hey I was trying to mess around with adventure mode and warwolves. I've looked around the raws but cannot find anything on them or werewolves. I literally just want to change their ability to see in the dark a bit and make a cave version of them. But I can't seem to find them in the raws except for the curse. Are they under a different name or something in the raws or am I just not understanding the raws enough. I am extremely new to modding and had tried to mod in a creature from scratch and failed. Or used a human as a base. So I was going to start small and just edit an already made creature and war wolves happened to be the ones I was most interested in right now. Just popping in to let you know that the Wiki seems to be down. If it's not one thing, it's another, isn't it! Thanks for all the work you put into this; will be trying it soon. Hi SageHeist, I can confirm they are in there in the FDII raws. Dark Ages III: War & Mythos [44.12] [v38] [64-bit] has been released. For the record, the first corrupt person in Dwarf Fortress was Irne Locksnarl, a human from Postrushed. He was a miner, then a bard, but when the opportunity to become the chief chef of the entire kingdom opened up, he took it. After being tempted several times over the years, finally, after fifteen years in the job, Irne began scheming a bit extra out of the kitchen budget. One can imagine a few things a villain could do with that information. At least, that'll be our job next month, heh. We've also moved profaning temples under this framework (up to this point it has been completely random), and we've also added business rivalries leading to sabotage, gambling problems, and related w.g. activity. That's almost all we need! Another look at religion, and we're ready to revisit villains. Villains and corruption will have a big impact on DA due to the many thriving monstrous, vampire, and werebeast strains already leading double lives in the world... Adding these to the (long time coming) vanilla magic system should make for a huge number of possibilities. Profaning temples becoming less random may lead to corrupt individuals (near deliberately) being granted powerful spell-like abilities. Playing a new game after a long break. 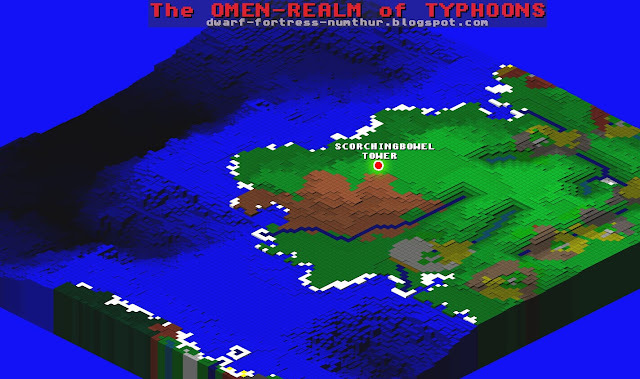 I generated a new world using your custom Medium sized world parameters. There are no thriving dwarven societies, only two anywhere, and both are Legendary Dwarfs. Nearby are some Gnolls, some Human Fighters, and further out, some lizardmen. I chose to revive a group of Legendary Dwarfs. The fort is coming along, and we've so far had minor losses... one dwarf got eaten by a Great Wolf and another got trapped in a tunnel and died of starvation and dehydration before we could find him. The Queen, who crowned herself in the second year, and one of our smiths got ravaged by a wandering Batsquatch, but both managed to survive. We had to have the butcher temporarily take up the role of Chief Medical Dwarf, since both of those ravaged were our primary medical professionals... Luck? Fun? Same difference. Things are going well so far, and the Queen is in the process of recovering... she won't stay in bed, but oh well, she'll recover eventually... The Trap Tunnels are nearing completion, and the next job is to rig up our drawbridges to secure our Dwarf-home. We have received multiple waves of Dwarfen immigrants, though the only trade caravan has come from the Humans. Presently, we are facing our second Winter and all the water froze... We are scrambling to produce enough drink to keep the fortress alive since all the water froze and we have not yet finished the well tunnel from the nearby stream (surprisingly, or not, that is the tunnel in which we lost our second casualty). We will adapt and overcome! Also, we keep getting word that the Gnolls will look to us to support them economically, though we have no idea what that might mean... we have seen nothing of them thus far, but stay alert in case they mean to raid our vaults. There are no thriving dwarven societies, only two anywhere, and both are Legendary Dwarfs. Nearby are some Gnolls, some Human Fighters, and further out, some lizardmen. I chose to revive a group of Legendary Dwarfs. The fort is coming along, and we've so far had minor losses... one dwarf got eaten by a Great Wolf and another got trapped in a tunnel and died of starvation and dehydration before we could find him. The Queen, who crowned herself in the second year, and one of our smiths got ravaged by a wandering Batsquatch, but both managed to survive. We had to have the butcher temporarily take up the role of Chief Medical Dwarf, since both of those ravaged were our primary medical professionals... Luck? Fun? Same difference. Thank you for the detailed fortress report LtGreeneyes. Good to know Batsquatch are still alive and kicking. The fortress is progressing fairly well... We breached the caverns VERY early and found some lava within the first layer (or at least within the first opening if the layers are connected... not sure how to tell. ) We have not yet explored the caverns as a Forgotten Beast showed up fairly quickly. We've heard lots of screams from multiple different species from down there. We aren't opening up the caverns any time soon. We had a Dwarven caravan with a liaison show up for the first time after a couple years in, though the caravan was immediately scared off by a pack of Great Warthogs. That was last year... it is now Summer. An Old One has appeared and is destroying the local wildlife population. We have sealed ourselves inside with our bridges raised. The Human Caravan is almost ready to leave, though... we're contemplating letting them leave, though we're uncertain of the potential consequences. At best, they kill the thing, or maim it, and at worst... well, maybe we won't be seeing any more Human Fighters for a while. Not much time left to make our decision as they are making preparations to leave. We're, of course, also worried about the Old One gaining entrance in the process of letting the humans out. We think it'll be too busy tearing them to shreds to try, though. We will likely give it a try, then put the bridges back up. Maybe the Old One will get bored and find other living things to destroy. We are beginning to understand why there are so few people around. The Humans made it out... We had to encourage them to leave by tearing down the depot around them, but they left, and without casualties, even! Now we settle in and hope the Old One decides to leave. What is the name of your fort LtGreeneyes? I shall produce a chronicle of your report. The fortress is named Avuzritan, "Minebegins." It has been several seasons and the Old One, named Guthstak odubbul Rurast Vetek, is still wreaking havok upon the local wildlife. The ravens, turkeys, wild boar and great wolves seem to provide a constant supply of targets for it to destroy. There have been no migrants since its arrival either. We believe we may have seen the last for a long time, though we now number 130 dwarves and 1 human monster hunter. However, we DID have two more Paladins arrive a season or two back. We lowered the bridges and they ran inside. We think the Old One was too busy chasing down and slaughtering some turkeys. Sadly, we have had to move all our operations indoors. The kitchens, butcher shop, and tannery have all been moved already, and we have begun digging out a large cavern in which to grow trees. We have also begun the planning stages of bringing magma closer to the surface... the lack of wood is hurting us. The magma we found in the first layer of caverns appears to be a tube, which is lucky for us as we haven't had to dig TOO deep yet. We created a small chamber with an alunite floodgate so we can have a controlled flow to draw from. Our need for more metal equipment in order to pump the magma has forced us to create a smithing chamber down near to the magma tube, just above the artificial pool we have created. Opening the last wall into the tube itself resulted in a death, luckily it was not our Queen who mined that particular wall, but one of our doctors. Also lucky that we've had several skilled doctors arrive, so it wasn't as harmful as it could have been, though the loss weighs heavy upon our hearts. We will engrave a slab in his memory. We also lost another dwarf, a wood cutter. She seemed somewhat melancholy to begin with, but started a couple fights with others in the colony and we had to put her in jail. She kept muttering about how her life was a nightmare. We did what we could for her, but during her sentence her condition continued to worsen. She apparently felt extremely embarrassed about being incarcerated and had a small mental break, but seemed to recover from it. Some time after her release, she had a total meltdown and eventually went berserk... we had to put her down before she could hurt anyone. She will be buried in our mausoleum. We will have to consider making that chamber grander... it is not fitting that our dead lie in a rough chamber. Another project to add to the list. We have also begun digging out a way to safely enter the caverns below... we are planning to create some fortifications to allow our marksdwarves to fire upon enemies more safely and watch over any workers that enter. We have heard a distinct lack of screams from below for over a year now, so hopefully the great beast from before has traveled far from us. A new season arrived and, after multiple seasons of no migrants, a large flock of new migrants arrived. Many were slaughtered by the Old One and the bridges were lowered in the hopes of saving a few. 6 made it in and though orders were given to raise the bridges, the Old One gained entrance. It was a bloodbath. Our military rushed out to face it and fought bravely. Many citizens rushed in as well. The Old One would have been handled, however, either many were driven mad facing the thing, or we had enemies hidden among us. Abomination Summoners began raising the corpses of our fallen, including their severed limbs. We had never even heard of anything like it. We sealed the bridges, trapping the Old One and the summoners and undead within. There may be other survivors, but I have not left my chamber to find out. I will soon die of thirst, but I chronicle our story in the hopes that some one can learn from our mistakes... or hunt down and destroy the enemy, if you haven't done so already. Good bye and good luck. Beautiful presentation! I found multiple examples of bad writing in there, but I think I can safely attribute them to being tired, lol. I think I may generate a new world for the next fort... I'd like to have a thriving civilization to start from and sieging enemies. Let's see what I can figure out! I'm currently working with a laptop, so the power available to dedicate to DF is somewhat limited. If you ever want to make edits or post a new fortress report, I can easily update this one or post a new chronicle.